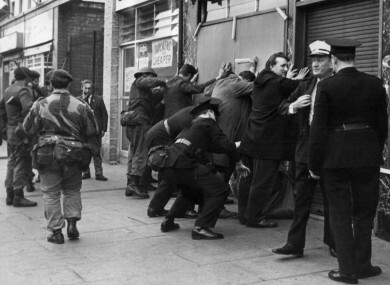 File photo: British soldiers searching people in Shankill Road, Belfast in October 1969. DOCUMENTS FROM THE UK’s Ministry of Defence (MOD) have suggested that torture techniques such as waterboarding and electro shock were used by the British army in Northern Ireland in the 1970s. Channel 4 News also reports that Taoiseach Jack Lynch had directly raised the issue of torture being used in the North with Prime Minister Ted Heath in late-1972. MOD memos show that they considered the torture claims to be credible, and sought to compensate some of the victims. The Pat Finucane Centre in Belfast helped to uncover the documents and said that they provide “new evidence of what both British and Irish governments knew at the highest level”. The alleged torture was said to have been carried out by the British parachute regiment, who’d taken to the streets of Belfast in 1972, and who were said to have commandeered a primary school in Ballymurphy in west Belfast to use for this purpose. Reporter Alex Thomson spoke to some of the alleged torture victims, one who was only 17 at the time, who told him of their experiences. “I was brutalised,” one said. “A lot of physical beating and kicking, and then it progressed onto other forms of torture. One that is now being described as waterboarding. There was a cloth tied round my head. I was held face down by two soldiers and water was poured down the back of head which filled the cloth. It was the sensation of drowning. I was convinced [I was going to die]. Another man told of his own experience of being waterboarded before he was subjected to electro shock treatment. He said: “I remember being told to hold two sort of attachments. Behind me, I could hear a machine. Secret minutes from a meeting in Downing Street in late 1972 show that then-Taoiseach Jack Lynch raised this issue with Tory Prime Minister Ted Heath. Other memos obtained from the MOD indicate that the claims of torture were found to be credible. One said: “I think we must accept counsel’s advice that he was assaulted… having been subjected to electric shock treatment and having had his head immersed in water for prolonged periods of time.” It is understood the man in question was compensated in an out of court settlement. In 2014, an RTÉ documentary revealed how torture methods were used during internment in 1971 by the British State. The 14 “Hooded Men” were taken to a secret location in rural Derry, and were then subjected to a horrific series of interrogations. This led to a case being reopened by the Irish government and brought to the European Court of Human Rights in Strasbourg, where a verdict has yet to be reached. Just last week, former colonel and current Conservative MP, Bob Stewart, said he was “kind of a torturer” during his seven tours of Northern Ireland. Speaking to RTÉ’s Morning Ireland, Paul O’Connor from the Pat Finucane Centre called these documents “very significant”. Email “Taoiseach Jack Lynch confronted Prime Minister on torture claims in Northern Ireland”. Feedback on “Taoiseach Jack Lynch confronted Prime Minister on torture claims in Northern Ireland”.